Essential Brazilian rhythms to inspire you to a new level of groove! Drum Werks XIV mixes the traditional with the modern, the funky with the smooth. We really think these loops will fit your Brazilian oriented music, as well as adding a twist on any other style you write, and most of all inspire you with some new fresh ideas. Live, authentic Brazilian grooves – only on Drum Werks XIV! Drum Werks XIV: The Brazilian Kitchen offers a wide variety of Brazilian drum loops and styles in tempos ranging from 75-150 BPM. With eight (8) complete Groove Sets™, Drum Werks XIV will be your go-to disc for the classic Bossa and Samba grooves of Rio de Janeiro, to the fresh sounds of Xote, Baiao, Maracatu and more from the Northeast. 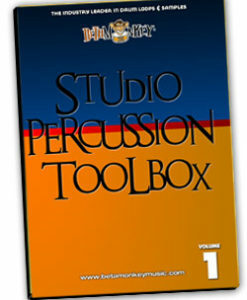 The disc includes groove variations, fills, one shot endings and a complete multi-velocity sample kit. The drum sounds were mixed with the goal of giving you the utmost versatility, aimed at the sounds of the instruments of the bateria. Live, open drums with little processing, the toms and kick resonate like surdos, the snare with body, but enough attack to emulate a repique, tamborim or caixa. As with all our Drum Werks releases, Drum Werks XIV carries the feel and swing you just can’t get on a drum machine. And in this case, without Beta Monkey you’d be hard pressed to get it at all outside of Brazil. Powerful natural sounds, infectious Latin grooves. Drum Werks XIV is pure rhythmic inspiration. Make it swing! A Great Overview of Essential Brazilian Rhythms: You’ll have all the tools need to build your favorite Brazilian influenced songs, and Drum Werks XIV is also a great tool to inspire your writing. These grooves are a great alternative to the standard beats usually found in your favorite styles. Try the baiao/maracatu for your next rock tune! Comprehensive Groove Sets™: Ranging from 50 BPM to 150 BPM, the Brazilian Kitchen will the deliver the feels we dare any drum machine or virtual drummer to match! Cohesive Drum Sounds: All drum loops are taken from the SAME recording session (all grooves, fills, etc., are sonically-matched). Like to change tempos or feels? You can mix any loop with anything else on the disc. The bottom line here is maximum versatility. Fully-Sampled Drum and Cymbal Samples: Build even more great grooves with a collection of all the drums and cymbals recorded on Drum Werks XIV. 607 (680 MB 24 bit WAV; 482 MB 16 bit WAV) original, license-free ACIDized or APPLE LOOPS/AIFF loops. 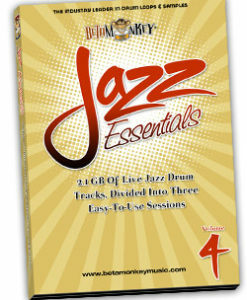 67 (35 MB) multi-velocity drum and cymbal samples. ALL ACIDized WAV, and APPLE formats included for download option and for hard copy DVD purchases. 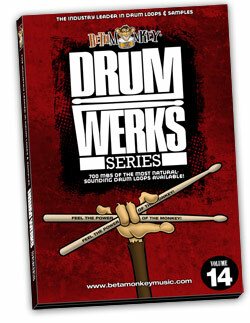 Read what MusicTech Magazine had to say about Drum Werks XIV: The Brazilian Kitchen drum loops.